Varieties are tested in the sowing year plus three evaluation years. Cool season grasses relevant for testing on greens are velvet bentgrass (Agrostis canina), colonial bentgrass (UK: browntop, Agrostis capillaris), creeping bentgrass (Agrostis stolonifera), chewings fescue (Festuca rubra ssp. commutata), slender creeping red fescue (Festuca rubra var. trichophylla), perennial ryegrass (Lolium perenne), annual bluegrass (UK: annual meadowgrass, Poa annua), rough bluegrass (UK: annual meadowgrass, Poa trivialis) and prostate bluegrass (UK: prostrate meadowgrass, Poa supina). Applications should be submitted to NIBIO Turfgrass Research Group, Landvik, Reddalsveien 215, N-4886 Grimstad, Norway. Seed of optimal quality should be shipped without charge by the variety owner/representative to NIBIO Landvik. On request the variety owner/representatives should also send seed of reference varieties to ensure that these are of optimal seed quality. 1) When taken out of the marked, reference varieties might be replaced with newer and more suitable varieties. However, in order to maintain continuity, only one of two reference varieties can be replaced at a time. The trials are conducted on sand-based golf greens at Korpa GC, Reykjavik, Iceland and NIBIO Apelsvoll, Gjøvik, Norway, representing the North- Scandinavian test zone, and Sydsjælland GC, Mogenstrup, Denmark and Bioforsk Landvik, Grimstad, Norway, representing the South-Scandinavian test zone. Each trial is established according to a split plot design with three blocks, species on main plots and varieties on subplots. The field plan must allow different mowing heights and different fertilizer levels to the different species. Between species, there should be at least 1 m borders seeded with a non-running grass species (e.g. chewings fescue) to avoid contamination among species. The plot size is 1.0 m x 1. 0 m. Sowing rates are to 0.7, 3.0, 1.5 and 4.0 kg pr. 100 m2 for bentgrasses, fescues, bluegrasses and perennial ryegrass, respectively. Before sowing, the sand-based green must be compressed and levelled out carefully to avoid any settling or low spots during the experimental period. The highest point should be in the middle of the trial, thus allowing 0.5 % inclination in all four directions. The seedbed must be compacted so that footsteps do not penetrate more than 1 mm at sowing. One to two days before sowing, fertilizers should be raked into the top layer (see next paragraph) and the rootzone irrigated to field capacity. Sowing of plots is carried out on a day without wind and using a LxBxH = 1m x 1m x 0.5 m sowing box that prevents seeds from contaminating eighbor plots. The seed should be raked carefully into the upper seedbed (ideal sowing depth 0.5-1.0 cm) before trampling by foot. Make sure there is no seed under the feet before moving to a new plot. After seeding, the experiment is covered with a white, permeable tarp to reduce evaporation from the seedbed and to prevent erosion by wind or water. The tarp must be removed within 2-3 days after emergence to avoid seedlings from growing into the tarp (5-10 days after sowing depending on soil temperature). The trials should be mowed with triplex or single (walk-behind) green mowers at least three times per week (Monday, Wednesday, Friday). Sharp knives is important to record the correct performance of each variety. Mowing is preceded by a light-weight rolling to ensure a firm and uniform surface and avoid scalping at the first mowing. The first mowing is carried out to 9 mm when the fastest growing varieties have reached a height of 12 mm. After that, the mowing height is lowered 1 mm per week to 6 mm for red fescue, perennial ryegrass and prostate bluegrass and to 4 mm for bentgrasses, annual bluegrass and rough bluegrass. These are the lowest mowing heights to be implemented in the grow-in year. The first mowing in spring is conducted with a bench-setting of 7 mm for fescues, perennial ryegrass and prostrate bluegrass, and 5 mm for bentgrasses, annual bluegrass and rough bluegrass. Then the mowing height is reduced by 0.5 mm per week to a minimum height of 5 mm and 3 mm, respectively. Starting between 1 and 15 September depending on the length of growing season, the mowing height is increased by 0.5 mm per week in fescues, perennial ryegrass and Poa sp.. The mowing height in Agrostis sp. is not increased before winter. The trials should receive a balanced applications of granular or liquid fertilizers every second week. The total fertilizer rate is adjusted for rootzone composition (e.g. use of compost amendment) and length or growing season at each experimental site. A slow-release organic or inorganic fertilizer, rich in P, is raked into the upper 3-4 cm of the rootzone before sowing. The total N-rate is adjusted to 0.7 kg N/100 m2. After seeding, the first fertilizer application is carried out shortly after field emergence / tarp removal. Then fertilizers are applied weekly during the first five weeks after emergence. After that the application frequency is reduced to every second week. Fertilizer applications during grown-in is not differentiated among species and should correspond to 0.15-0.25 kg N/100 m2 per application. The trials receive fertilizer every second week according to a fertilizer plan set up before the growing season. Provided no special need for repair after damages, the recommended seasonal rate is 1.4 - 1.6 kg N/100m2 to creeping bentgrass, bluegrasses and perennial ryegrass. To velvet bentgrass, colonial bentgrass and fescues, each application should be reduced by 35% compared with the other species. Fertilizer applications in weeks with verticutting or aeration treatments should be carried out after these treatments. The field capacity of the rootzone and the distribution uniformity of the irrigation system should be monitored before starting the trial. Rain gauges should be set out in a grid of 2m x 2m and irrigation uniformity checked during a night with no wind. A distribution uniformity of less than 75 (100 x the average of the 25% of gauges with least water / the overall average) is not acceptable and should result in adjustments of the irrigation system. During germination and field emergence, the trial should be irrigated with 2 mm water every second hour from 0800 h to 1800 h.
After grow-in and in the evaluation years, the trial should always receive 3-5 mm water after each fertilization or topdressing. Apart from this, the green is deficit-irrigated to 80 % of field capacity three to four times per week based on TDR measurements. The preferred timing of irrigation is in the morning between dawn and 8 am. Starting not later than two months after seeding, the trial should be topdressed with pure sand, grain size 0.2-0.7 mm, or a compost-amended sand (Green Mix, ignition loss not higher than 1.0 %) at least once a month. The best way to dress the greens is a weekly dusting, e.g, 0.30 liter sand per m2. The amount should be doubled in conjunction with verticutting or surface aeration (see later paragraphs). Depending on the length of the growing season, the seasonal amount of topdressing sand should correspond to 8-10 mm. The sand must be distributed uniformly to all plots, either by hand or using a dressing machine. 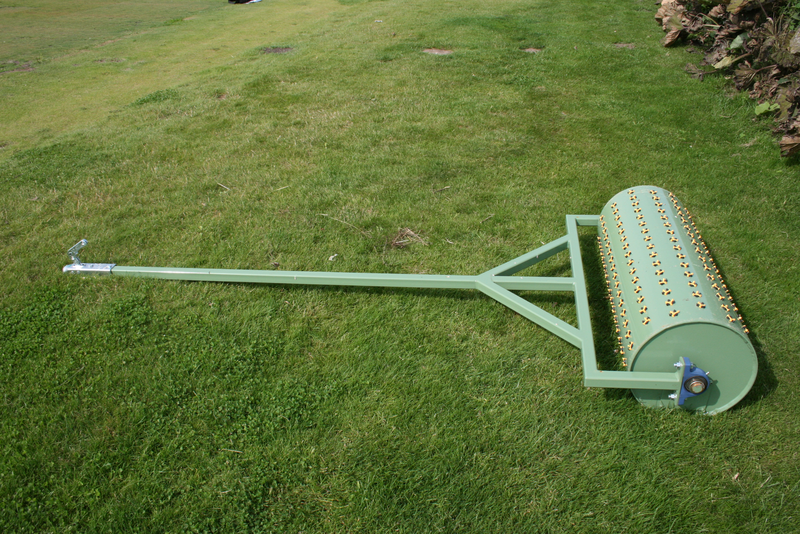 Starting in the first evaluation year, the trials are exposed to the wear and compaction from a friction wear drum, equipped with soft spikes. With six passes per week, this corresponds to 20.000 rounds of golf per year. The drum is pulled by a small tractor (Gator) and the direction is varied from time to time. Starting in the first evaluation year, all plots are be aerated to 3-4 cm depth once a month. The aeration can can be accomplished with a slicer or with an aerator equipped with 6 mm soild tines. Aeration is always followed by double ampount of topdressing. As far as possible, dew should be removed in the morning, at least on days without mowing. Plots seeded with bentgrasses, prostrate bluegrass and annual bluegrass can be verticut to 1 mm depth up to five times per season. Less verticutting is needed if there is no accumulation of thatch. Plots seeded with fescues and species are normally not verticut. Verticutting should be followed by double amount of topdressing. Avoid verticutting on hot days. Root and thatch development should be monitored at least twice per season. If the rootzone is compact and the average root depth, measured as the depth of intact hanging cylinder, is less than 15 cm, the green should be be deep-aerated and decompressed to 20-25 cm depth using a Vertidrain or similar machine. Hollow tine coring should normally be avoided as it can lead to contamination of different varieties among plots. Reseeding of plots in spring should only be carried out if the winter damage of at least one variety within a species is so severe that its live turf cover in spring is less than 25% of plot area. In this case, all plots within that species should be verticut and/or surface aerated, reseeded with the same amount of seed as used for the initial establishment, and topdressed with double amount of sand. Fertilizer rates and mowing heights should be adjusted to facilitate as fast recovery as possible. Coverage: Per cent of plot area covered with undiseased turf of the sown species, diseased turf, weeds (both dicots and grasses) and bare soil is recorded for the first time three weeks after sowing and then on the first of every month until the soil is frozen or the experiment is covered by snow. If not immediately clear, diseases should be diagnosed by sending samples to Bioforsk Turfgrass Diagnostic Lab. at Landvik. Coverage of weeds and diseases can be recorded with one decimal. The lowest figure to be used is 0.1% of plot area (10 cm2). Turfgrass visual quality (overall impression): This is an overall score for live ground cover, uniformity, greenness, fineness, disease resistance and shoot density, scale 1-9 where 9 is the best turf. It is recorded on the same dates as coverage. Fineness of leaves (leaf texture) (scale 1-9, 1-very course, 3-course, 5-medium, 7-fine and 9-very fine) is assessed on 1 May and 1 September. Turf height is measured before mowing on the first Monday in each month during the growing season. At least three readings are taken with a John Deere prism per plot. Daily height increments are calculated from the readings and information about mowing height (bench setting) at the previous mowing (usually on the preceding Friday). Snow molds are recorded as per cent of plot area on the same day or the day after snow melt. The casual patogen should be stated and/or samples sent to the Bioforsk Turfgrass Diagnostic Lab. Overall winter damage, i.e. per cent of plot area dead due to abiotic or biotic damages should be recorded 1-2 weeks after green-up. The reason for damage should be recorded as far as possible. Winter color is the intensity of green color outside the growing season: 1-completely brown/withered, 5-pale green, 7-green and 9-intensely green. If no snow cover, winter color should be assessed on 1 December and 1 March. Otherwise winter color should be assessed shortly before and shortly after the period of snow cover.